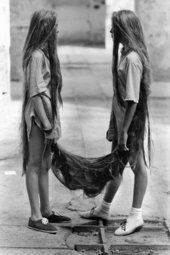 Brazilian artist Tunga’s legendary performance featuring twins connected by their hair will be staged at Tate Modern for the first time, starting from tomorrow. The signature performance work, Xifópagas Capilares entre Nós (Capillary Xiphopagus among Us) reflects the artist’s fascination with the uncanny and surreal. This work demonstrates the artist’s desire to create unexpected and inexplicable worlds through his inventions, blurring the boundaries between reality and myth. The performance will be staged at Tate Modern at irregular times across a series of weekends in July and August. 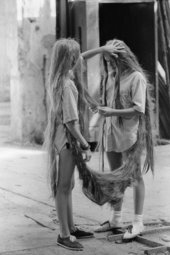 Xifópagas Capilares entre Nós was first staged in 1984 and features twin adolescent girls who appear unexpectedly and sporadically in the galleries. Tunga based the performance upon a myth of conjoined Nordic girls whose existence caused conflict in their homeland. He also published an essay of the same title, which describes the myth amongst a variety of unusual occurrences. Tunga’s exploration of materials and the uncanny manifests itself in the form of his large sculpture Braid c.1983, which can be viewed in Tate Modern’s free collection displays. Hair, and specifically the form of the braid, is a recurring symbol across much of his work, which often used materials such as copper and other metals. The sculpture currently on display is made entirely of lead and remains one of the earliest and largest of the series. Antonio José de Barros Carvalho e Mello Mourão (1952–2016) known professionally as Tunga, was born in Palmares, Pernambuco, Brazil, and was one recognized as one of the leading Brazilian artists of his generation. Working across multiple disciplines including sculpture, installation, video and performance, his practice addresses a wide set of themes such as archaeology, mythology, philosophy, psychology and literature. Tunga’s work is spread across international collections, including institutions such as the Museum of Modern Art in New York, the Museum of Contemporary Art in Los Angeles, Museo Nacional Centro de Arte Reina Sofia in Madrid, and Stockholm’s Moderna Museet. Other free collection displays opening at Tate Modern this summer include Aldo Tambellini (23rd July), ARTIST ROOMS: Jenny Holzer (23rd July), Olga Chernysheva, Helga Paris and Chris Killip (30th July) Magic Realism: Art in Weimar Germany (1919-1933) (30th July) and Fernell Franco (30th July). Xifópagas Capilares entre Nós (Capillary Xiphopagus among Us) will run throughout the day on Fridays–Sundays: 20–22 July, 27–29 July, 3–5 August and 10–12 August 2018. The performances are free and will take place throughout the galleries. Curated by Michael Wellen, Curator, International Art and Fiontán Moran, Assistant Curator. The performance is supported by Tate Patrons, Catherine Petitgas, and Tate Americas Foundation courtesy of the Latin American Acquisitions Committee, Estrellita Brodsky and Juan Yarur Torres.